I don’t think we’ll have anything like personal flying cars until we are in the age where they would be driverless. I’m trying to imagine back when I was learning to drive and adding the complexity of the z-axis. …some people can barely grasp the x- and y-axes right now. I get the x and y, though they do try to wiggle from my hands – it’s time that escapes me. I’m so scared of the thought of driving a car, so I won’t get a driver’s license. Call me a wimp, sure, but I’m too afraid of traffic accidents, and I’m really really really bad at driving in video games (not that I think that it’s similar to driving a real car, though). I tend to be an overly defensive driver and the fact that i’m caustrophobic means i don’t even like being in cars at all. I ride my bike or walk places. If i ever need to go anywhere further than my bike can take me, i can usually get a ride from a parent/friend. I think if i get my license, i’m going to have to learn how to ride a motorcycle. Those are more dangerous, not less – harder for other drivers to see you, and easier to push you into the off-ramp for the canyon floor shortcut without noticing you want to get over. It’s 2012 – And STILL no flying car! 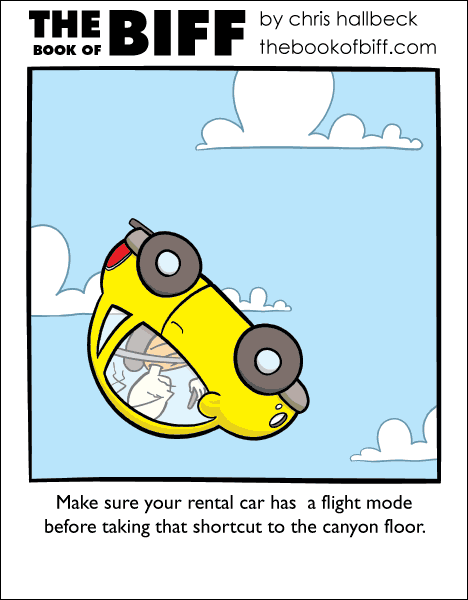 Flying cars will not be feasable when you consider the boneheads that make taking to the road a challenge now. Imagine texting and piloting. It’d be like traffic jams on The Jetsons, or that one episode of Doctor Who, where drivers aren’t that much different than now. I’m trying to jump-start Darwin here! I bought the rental car insurance, so it’s all good. goddammit chris why do you keep making awesome things. now i have another comic i have to read. Why is biff driving a clown car!?!? HAH!!! Anyways chris make more!